Designed by architects Bernhard and Stefan Marte, the new museum building lies at the gateway to the Wachau and is dedicated to Austrian art. People’s day-to-day realities form the cornerstone of the program, which encompasses all art genres and juxtaposes old with new. 3,000 m2 of exhibition space, spread across five floors, establish dialogue between the State Collections of Lower Austria and important private collections. Themed and personal exhibitions answer questions concerning current issues. The State Gallery of Lower Austria reveals Lower Austria as an artistic landscape that, alongside Vienna and neighboring countries, uniquely enriches European artistic production. To this day, the region is home to many outstanding artists. Featuring a striking rotating shape, the State Gallery of Lower Austria is also an embodiment of the present times architecturally. 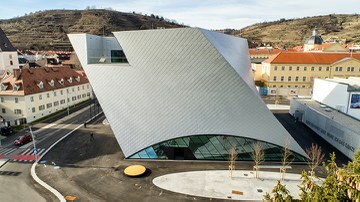 Alongside the Kunsthalle Krems and the Karikaturmuseum Krems, it now forms Kunstmeile Krems’ new center.